We recieve news that our boxes might be arriving soon! I really really can't wait. I missed my bed sooooo much. It is really expensive setting up a house omg! We are running dry on funds & that's why we are holding back on some furnitures and appliances. So the post might come very late, maybe till I feel my home is what I want it to be? But it's very fun to set up a home with someone you love. Buying stuff bit by bit & within our means. So now, I have a space allocated for microwave and it is still empty haha! My sofa is arriving next week. My bed headboard should be up next week too. YAY! I have no other pictures to offer, but my dining area is the most decent place in the house. 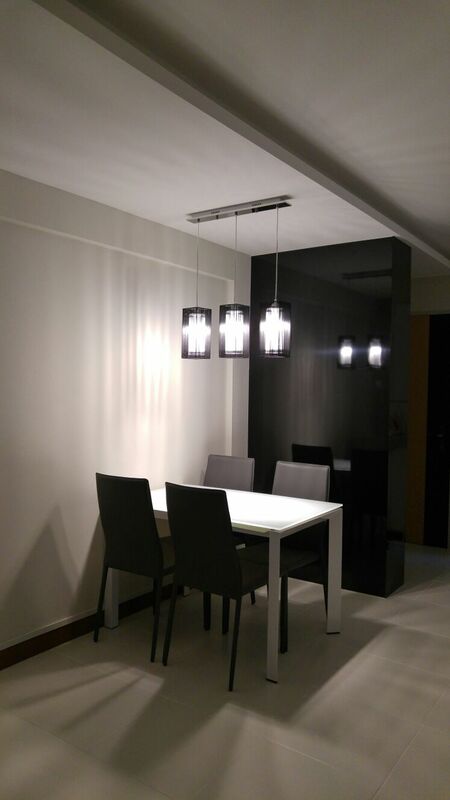 So here you go... Expandable tempered glass dining set & hanging 3 piece ceiling lights.